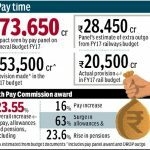 Here's how the 7th Pay Commission can affect your pay, most likely from August 2016! The 7th pay commission has everything to make a central government employee happy and satisfied! The Commission is most likely to decide on a 30% hike on the basic pay. The minimum basic monthly salary recommended … [Read more...] about Here’s how the 7th Pay Commission can affect your pay, most likely from August 2016!